The Carolina mantis: Did you know? The Carolina mantis, like all other praying mantis species, is a predator that feeds primarily on other arthropods (insectivore). Members of the group, including both ambush and pursuit predators, occupy diverse habitats distributed across the globe, although their greatest numbers and diversity are concentrated primarily in the tropics. Though unfortunate for their prey, the voracious appetite of the Carolina mantis has shown some usefulness for humans, as mantises are sometimes employed as agents of biological control in gardens. As apex predators of the insect world, praying mantises play an important role in regulating prey populations, which may in turn affect the biodiversity of an ecosystem. Understanding biodiversity is a significant challenge for humankind, as it may impact foundational processes such as nutrient cycling. 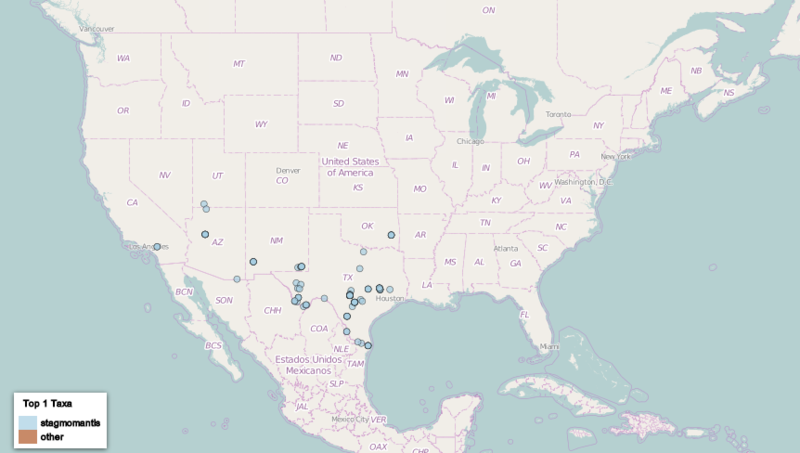 ​In order to monitor biodiversity changes and potentially inform land management and conservation decisions, the InvertEBase Thematic Collection Network is seeking to digitize millions of arthropod and mollusk collections currently housed in major North American museums. The online database containing this information will provide data with which scientists can analyze insect and arthropod distributions for important trends. Digitized Stagmomantis specimens in biological collections.